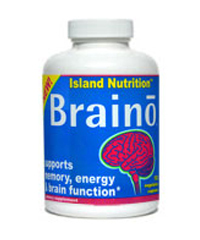 Braino is one of the least attractive brain supplements on the market. The white bottle with the graphics that look like they were made on Microsoft Paint in Windows 95 did not do much to make us feel like this supplement would be worth writing about. However, after taking the supplement, it was easy to see why it has a sort of cult following online. The ingredients are the real deal – like something that came straight from a scientific research lab and not a marketers playbook. Overall, this supplement delivers what it needs to, but at a fairly high price. Braino is made and distributed by Amazon Nutrition, and this small company has a history of shipping obscure but well-liked products. Braino does not have the attention of Alpha Brain, Lumonol, or TruBrain, but it does contain great ingredients made by a real scientific laboratory. The manufacturer is spending more time on getting the formula right than on making a shiny new label. Our standard Who Is lookup revealed only that the website has been active since 1999 as claimed by the company. The website is hosted by HostGator but the domain is kept private. There are no issues with this, but we wish we could find out more about this supplemet. Braino has an interesting ingredient list, complete with lab grade drugs and all-natural substances. There is a whopping 1 gram of choline, DMAE bitartrate, and bacopa, among other things. The full B vitamins are present in the ingredient list as well, and the formula increases blood flow to the brain, allows certain substances to sneak past the blood-brain barrier, and provide more oxygen to the brain, automatically making you more sharp and focused. We had to convince some of our panelists to take Braino, because of the scant information on the supplement. However, after we realized that the product was made up of industrial grade ingredients, and not the ‘fairy dust’ that sometimes is used by marketing teams to claim that certain ingredients are present, several people jumped on board. After taking a one-month’s supply of the supplement, our panelists noticed that doing everyday tasks were easier and took less time. People especially noted that the ability to dive into difficult tasks on a to-do list was increased. This is different from the jittery feeling that people something feel from taking other cognitive enhancers. Braino is priced relatively high when compared to other supplements. At $78.00 for a one month supply, this supplement is one of the most expensive we have reviewed. However we understand why the price is as high as it is. The ingredients included in Braino are substantial and of the highest quality. However, we also know that there are other nootropic pills that cost less and will do more. Check out pills that contain noopept, as it is 1000x stronger than piracetam, meaning that manufacturers can get in a full dose in each pill. The bottom line is that Braino is a good product, but expensive. Braino is a no-nonsense kind of pill. It has a plain-looking label, but the ingredients are solid. Take Braino if you are looking for a cognitive enhancer with some ‘meat.’ However, you should consider other pills that contain better ingredients for 30% less.